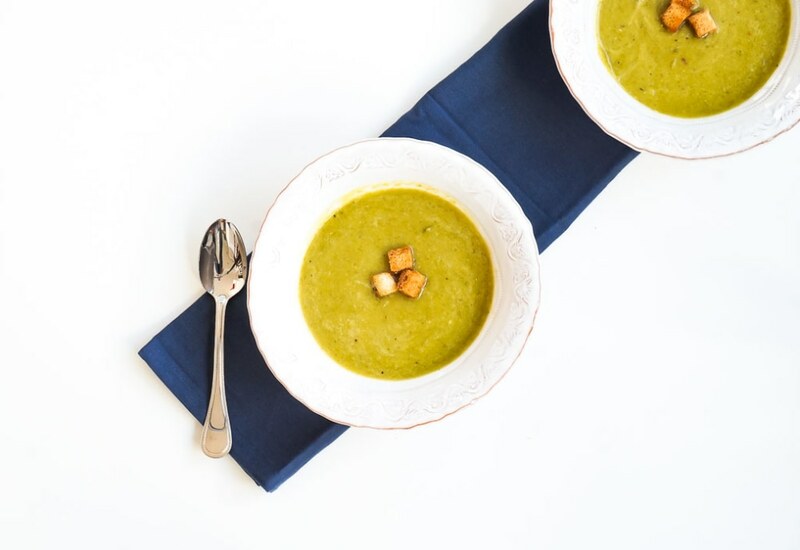 This split pea soup is a great quick lunch option during the colder months. Start by sauteing onion and celery in olive oil until translucent. Then add garlic, oregano, salt and pepper. Dried split peas are added along with chicken stock. When the peas are tender, they are blended quickly and easily using an immersion blender right in the cooking pot. The soup is served with prepared croutons for a beautiful garnish as well as to add a little crunch to every bite. (Try with rye croutons for a real flavor adventure!) This one pot meal is ready to serve in just about an hour. Did you know, in Finland split pea soup is traditionally served for Thursday night dinner? In pre-Reformation days it was meant to keep you full and satisfied through a Friday fasting day. It is paired with pancakes and jam for dessert! Per Serving: 191 calories; 9g fat; 21.5g carbohydrates; 8g protein; 1mg cholesterol; 737mg sodium. I love this healthy and delicious split pea soup! It's a great source of fiber, and pairs perfectly with ham. This is one of my favorite recipes to make during the cold winter months. This is one of my favorite comfort soup dishes. I used vegetable stock instead of chicken, so that I could share it with my mom who is a vegetarian. We both enjoyed it very much! This is good for the soul!